I’m feeling ambivalent towards Mother’s Day. That’s nothing unusual for me, ambivalence seems to be built in. Like all children I made little mother’s day gifts in kindergarten and school, tried to make breakfast in bed for my mother, and to be real thankful for all that she has done for me. Still having troubles with thankfulness, ‘though. Secretly I always thought I’d do the same if I were in her place, and I never felt that she was especially self-sacrificing. The ambivalence should have vanished when I became a feminist at age twelve and decided to stop celebrating mother’s day, because it’s reactionary, a florist’s chain invention, and because Hitler made it popular in Germany. Since then I have been giving my mother a “I think mother’s day is reactionary and commercial, but my best wishes anyway”-speech for mother’s day. This simplifies the question of gifts enormously. What’s really strange about this whole mother’day thing is, that it’s really, really important to me that my son’s giving me something. The first sign was my disappointment, when my husband didn’t give me flowers for my first mother’s day. Not that I’m thinking he should give me flowers on mother’s day, since I’m not his mother, but acting for our son… So I bought myself flowers. And was quite embarassed about feeling offended. The next mother’s day we went to a florist together to buy flowers for my mother-in-law, and I told them to pack a rose for me, too. On our way home we debated my ambivalent feelings. Since then it’s going better, the child’s in kindergarten and has been in playgroup before. 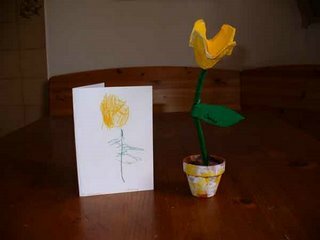 In playgroup they made littler cardboard-flowers, and the children got greeting cards with little poems. When I read mine, I cried! My husband went to get his mother’s flowers without me and when he came back, he sent me the little one with a flower pot. (Soooo cuuute!) This year I got my present for mother’s day on Friday (The child could’nt wait.) He made it all himself. With an almost recognisable dandelion. I’m so proud. The card says that he loves the most about his mom: going for walks. This is what you get, when your child has to participate in your walking workout routine. Today I phoned my mother because of mother’s day. Before I got to wish her the best, she wished me a nice mother’s day. Um. Sometimes I think I should buy her flowers. There is one thing I’m understanding better, since being a mother myself. Now and then my mother tells the story of my birth. It was quite dramatic, I was six weeks early, my mother was at home all alone, without a telephone, and didn’t know what happened. I was born on the way to the hospital in an ambulance. Then I was immediately transferred to another hospital. This took place at the end of the sixties. Parents were not allowed in the baby’s ward. No touching, nothing. How hard it must have been for my mother to see her little premature baby only through a window, I only understood, when, 35 years later, I couldn’t sleep in the hospital, because I had allowed the nurses to take my baby away for the night. And it wasn’t for a few hours for her, but for a few weeks. It was this, she had meant when she said, “It’s completely different when it’s your own children.” She meant this overwhelmingly big feeling, love that’s bigger than your own life. And it’s quite inapprehensible to feel it for somebody, but it’s totally inapprehensible that somebody feels it for you. But it’s certainly true. Hey, thanks for commenting on my site, love the double jolt. What kind of music do you teach, didn’t quite catch that? Oh, I’m teaching all over the place: voice, piano, guitar; jazz, pop, classical, rock. You know what I skip? cleaning toilests… They’re so yucky! Of course, when I skip that they just get yuckier. but, instead of doing them once a week, I do them every 2-3 weeks. I also put off mopping and laundry until I have to do them. I don’t have to skip cleaning toilets or doing laundry any longer, since the flylady-system helps me doing the essential housework with a minimum of fuss.